Swarna Bhasma 8.62 mg, Rajat Bhasma 8.62 mg, Vanga Bhasma 12.93 mg, Naga Bhasma 12.93mg, Lauha Bhasma 12.93 mg, Abhraka Bhasma 17.24 mg, Pravala Bhasma 17.24 mg, Mukta Bhasma 17.24 mg, Rasa Sindur 17.24 mg. 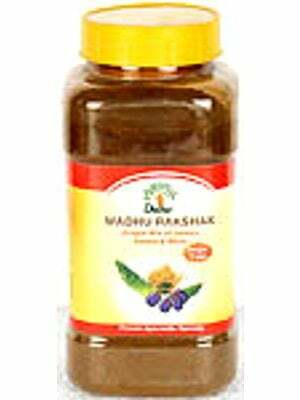 Indication: Administration of this medicine relieves Physical and mental weakness and also recommended for diabetes, Diabetic carbuncle, Diabetic neuropathy, Diabetic retinopathy. Dosage: 1 to 2 Tablets to be taken in the morning and evening with milk or as directed by the physician. Diet: Pulses, Karela, Papaya, Parwal, Rock Salt, Black Pepper. Avoid: Butter, Cream, Rice, Potatoes, Oily & Spicy Food.